Byungwoo Ryu, Ph.D., is an Associate Member of the Center for Discovery and Innovation. 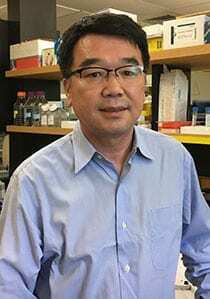 Dr. Ryu’s research interests include reprogramming the epigenome of cancer cells by chemically and/or genetically targeting epigenetic modifiers to improve clinical outcomes using existing cancer therapies. Epigenetics is defined as heritable molecular determinants of cellular phenotypes independent of DNA sequences, comprising histone modifications, DNA methylation, chromatin structure, and non-coding RNAs. It is now a well-established concept that aberrant regulation of these processes causes the activation of a full range of oncogenic potentials, as evidenced in permissive chromatin of cancer cells (epigenetic plasticity), which plays a significant role in cancer development and malignant progression— including the development of metastasis and resistance to therapy. Dr. Ryu’s group’s efforts focus on understanding the underlying mechanisms of epigenetic processes in cancer. The long-term goal is to discover new epigenetic vulnerability pathways that can be targeted to treat cancer.